Brandon University hosted six teams of high school students for the first Brandon High School Computer Science Competition. The Crocus Plains team of Beatrice Nabong, Reilly Keele and Harshal Patel finished in first place locally as Brandon University hosted six teams for the inaugural Brandon High School Computer Science Competition, a satellite of the Manitoba High School Programming Competition. Smiles and stress were visible as these teams, along with 23 other teams in Winnipeg, attempted to solve six difficult programming problems in the fastest time. A total of 18 students from all three Brandon high schools (Crocus Plains, Vincent Massey, and Neelin) competed. In addition to finishing first among the Brandon contingent, Crocus Plains placed ninth overall for Manitoba. 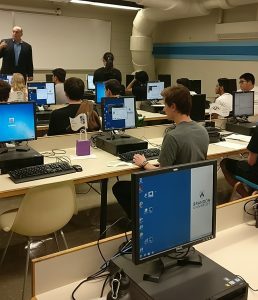 Congratulations to all competitors and thanks to the Brandon University Computer Science Department for providing this opportunity for young programmers to compete.